So this super hero phase. It’s just unavoidable for a certain type of boy, and I’m pretty sure that not only do I have that type of little boy, but I like that kind of kid who leans towards the comics. So when I received The Official DC Super Hero Cookbook, I could not wait for my tiny dude to check it out. Yeah, OK, I’ve made more recipe promises than I’ll probably keep. 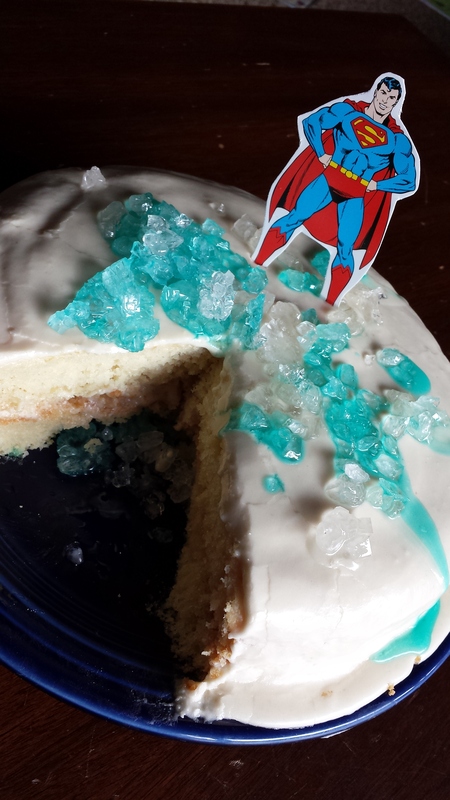 But I did decide that the Fortress of Solitude Crystal Cake would be one I had to gluten-free sooner rather than later. I mean, do you see this face? I was growing things in my dining room, which is cool and all, but it doesn’t come out of there all that easily at the end of the growing period. Next time, I’m making a gluten-free white cake from scratch and buying the freaking blue and white rock candy. But just in case you’re curious, here’s how to make that candy. If you’ve got a much more patient 4-year-old than I have, it should be no problem. OH, and you just sprinkle it atop a white cake with buttercream icing and get yourself a Superman toy/cardboard cutout/whatnot. 2. Heat both mixtures to a boil, constantly stirring. Allow mixture to boil, but for a short time. Stir the sugar until it has completely dissolved. Add a few drops of food coloring to one saucepan. 3. Remove sugar mixture from heat and allow to cool for 15 minutes. 4. Set up your glass jars and pencils by tying the string pieces around the two pencils. Attach a weight to the bottom of the string. 5. Pour cooled clear sugar mixture into one jar, and the blue sugar mixture into the other. Drop the weight first into the center of each jar and rest the pencil across the mouth the of the jar. 6. 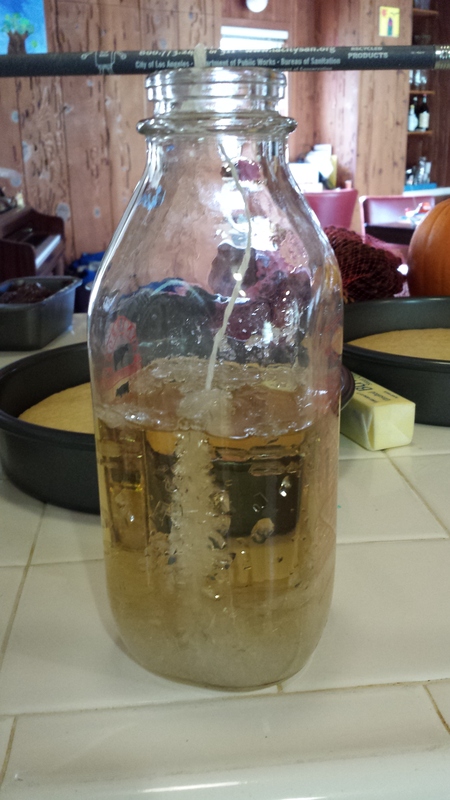 Wait 7-14 days for sugar crystals to form. Remove string from jar, and chip rock candy off the string. 7. Realize what a huge waste of your time this was given the inexpensiveness of already formed rock candy that is ready as soon as you knock it off the stick. 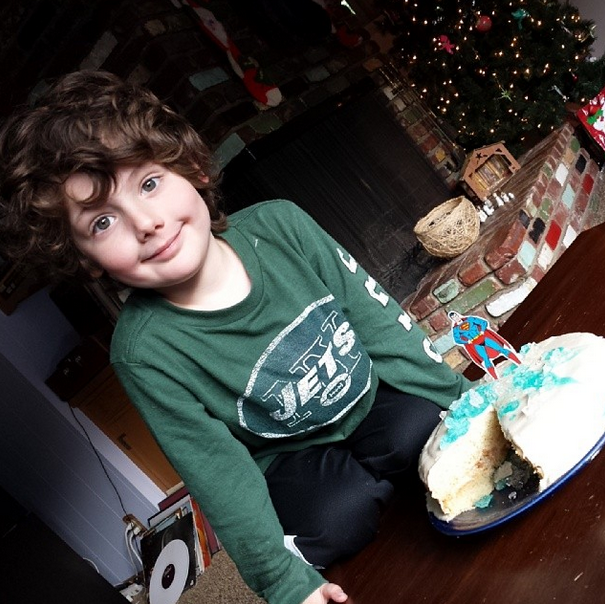 Tags: gluten free recipe, gluten-free cake, gluten-free kids, gluten-free rock candy. Bookmark the permalink. Previous post ← Happy New Year Gluten Haters & Lovers, Especially You! Omg you’re a super mom, I will never try making rock candy ever, thanks for the head’s up. Your guy looks so adorably pleased with all your hard work so worth it this one time.